England have extended their lead against Czech Republic right on the brink of halftime after Harry Kane converted a penalty won by Raheem Sterling. 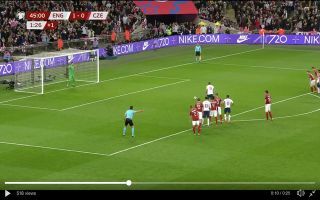 During stoppage time in the first half, Raheem Sterling drove into the penalty area and Czech Republic defenders Tomas Kalas and Pavel Kaderabek both came across the Manchester City star, leaving the referee to point to the spot. The foul was by no means the hardest you’ll ever see and some may call the penalty decision soft but it seems as though the referee couldn’t look past two defenders coming across Sterling. England captain Harry Kane stepped up and fired the ball into the back of the net. Captain @HKane doubles @England's lead from the spot! ?? The Czech Republic are seen as England’s most talented opponents in their qualifying group, with the Three Lions already showing that they are levels above Czech – this qualifying campaign will no doubt be one of the easiest to date. Gareth Southgate should use this period to continue to give talented young players like Jadon Sancho a chance, this will also ensure that today’s young stars will be ready for the task at Euro 2020.